Tracking the rare desert-adapted black rhino is an experience offered in very few places, one of them is Desert Rhino Camp in Damaraland. This activity is offered in conjunction with the Save The Rhino Trust (SRT), an organisation formed in 1982 to reduce poaching and save the black rhino which was then on the verge of extinction. Their work has been rewarded with a sizeable increase in the local rhino population. Your adventure starts the evening before, with a briefing from the SRT trackers who explain the background of the organisation, its aims and projects and advise you what to expect from your tracking experience. The next morning you have an early start as you set out in a 4x4 vehicle behind the SRT tracking team. Using their extensive records of the animals movements and tracking equipment they can locate rhinos in this vast area, though you may have to drive for some time to reach the location. Once found, the vehicles are parked and you set off on foot, tracking the animal. Moving slowly as you follow your guide, you gradually approach the rhino. The experienced trackers make sure that you'll never get too near, ensuring your safety at all times. The feeling of being so close to a wild animal with no barriers in between is truly thrilling. How long you remain with the rhino or rhinos will vary according to conditions, and will be determined by the trackers using their knowledge and judgement. Afterwards you return to the vehicle for the drive back to camp and some well-earned refreshments. No great level of fitness is required, though the landscape can be uneven and rocky so you need to be relatively sure footed and good walking boots are recommended. 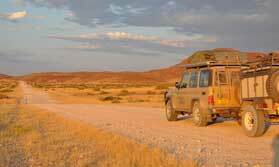 Rhino tracking is offered at Desert Rhino Camp in the Palmwag Concession area of Damaraland. Rhino tracking is offered all year round, subject to availability of the Save The Rhino Trust tracking teams. The tracking experience requires an early start from Desert Rhino Camp, driving to the location of the rhinos, where tracking on foot begins. You'll be under the guidance and supervision of the experienced tracking team, and the precise nature and duration of the activity will be determined by them. It should be noted that the trackers are not armed due to scarcity of the black rhino and the excellent visibility of the terrain, but they are extremely experienced and put your safety to the fore.